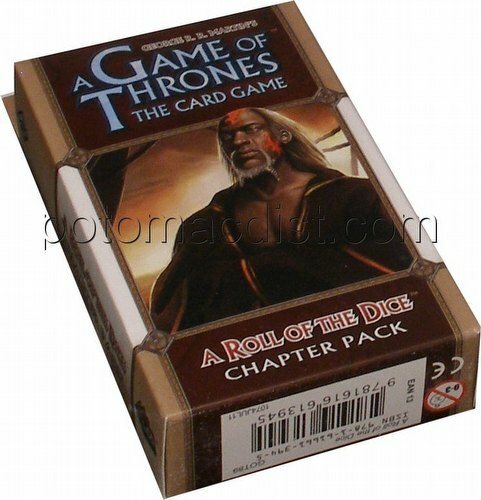 A Roll of the Dice is the sixth and final Chapter Pack in the Beyond the Narrow Sea cycle for A Game of Thrones: The Card Game. The Great Houses each take long gambles in A Roll of the Dice, with all of the Seven Kingdoms at stake. As they double down on the strategies they hope will win them the Iron Throne, the Great Houses introduce new players to the game of thrones and explore new locations. They reinforce their positions by recruiting Armies, hiring Mercenaries, and treating with their Allies. Nonetheless, at the heart of every gamble is an element of chance, and fate plays a large role in this climactic conclusion to the intrigues and struggles Beyond the Narrow Sea. The Chapter Pack introduces eight new events that can drive thrilling plot twists into your games. A Roll of the Dice includes 60 cards (three copies each of twenty different cards).